The war ended with a raging influenza epidemic, spread through Canada in part by infected soldiers returning from overseas. The Spanish influenza epidemic, uniquely lethal in attacking young, healthy bodies, killed at least 20 million people worldwide, including an estimated 50,000 Canadians. The flu was spread through bodily fluids and moved quickly through the population. The flu presented itself through fatigue and cough, but quickly attacked the body, creating mucous build-up in the lungs that could not be expelled. Victims of the flu could be dead within a day of contracting the illness. Canada’s flu dead included soldiers who had survived the fighting overseas only to succumb to illness once in Canada and thousands of family members who welcomed them home but perished soon after their arrival. The loss of so many Canadians had a profound social and economic impact on a country that had already suffered 60,000 war dead. The combined death toll significantly reduced the workforce. It left thousands of families without a primary wage earner and orphaned thousands of children. In attempting to halt the spread of the disease, many local governments shut down non-essential services. Provinces imposed quarantines and protective masks were required in public places. The epidemic led directly to the formation of the federal Department of Health in 1919. 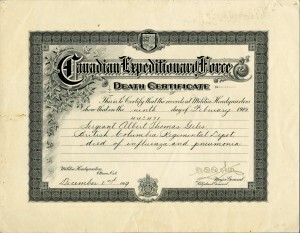 This death certificate was issued to Sergeant Albert Giles, who died of influenza on 9 February 1919. Official medical records note that 776 Canadian enlisted personnel, of an estimated 50,000 Canadians, died from the flu.